After two nights spent at Lake Superior Provincial Park, it was time to get back on the road. Our next stop was to visit friends who are building a house near Rossport on the north shore of Lake Superior. On the way there, I turned off to visit Aguasabon Gorge near Terrace Bay. 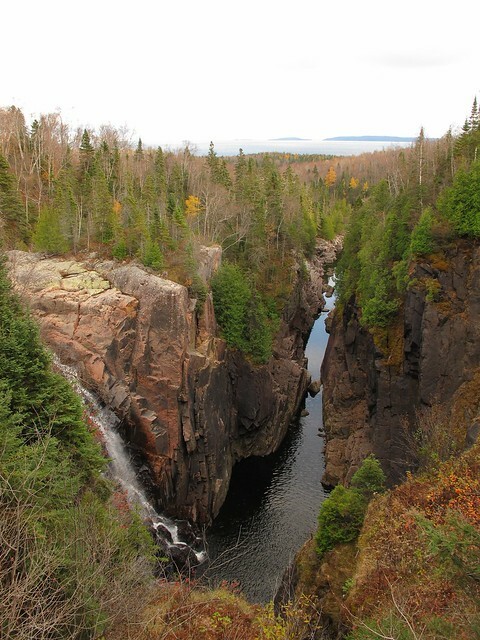 The above photo shows the 100 foot high falls and the river which flows onwards to Lake Superior (seen in the background). On this trip, I’ve been making a conscious effort to take time to stop and visit some of the places I’ve noticed but passed by on previous trips. In the past, I found traveling alone so demanding that it was hard to make myself stop long enough to look at anything. I’m pretty much as antsy as before, but at least I’m somewhat willing to listen to my inner voice of reason. 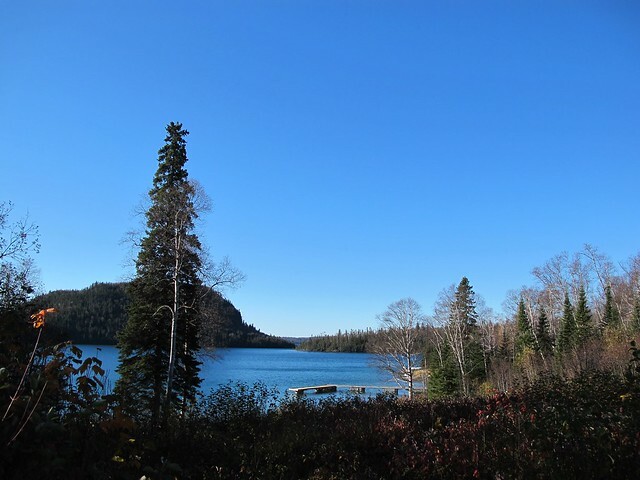 The dogs and I stayed three nights at Nicol Island near Rossport before getting underway once more. The above photo is of a neighboring island seen across the bay. For the most part, the weather has been excellent for this time of the year — real Indian Summer weather, the way I seem to remember it being when I was a kid growing up on the Ottawa River. Cold northern waters shimmering under bright blue skies with barely a cloud in sight. I’m gradually getting back into the swing of traveling and camping. the new cookstove seems to be working out quite well. I used the built-in griddle to make pancakes a couple of mornings. Both dogs love theirs served up with a little butter and maple syrup. 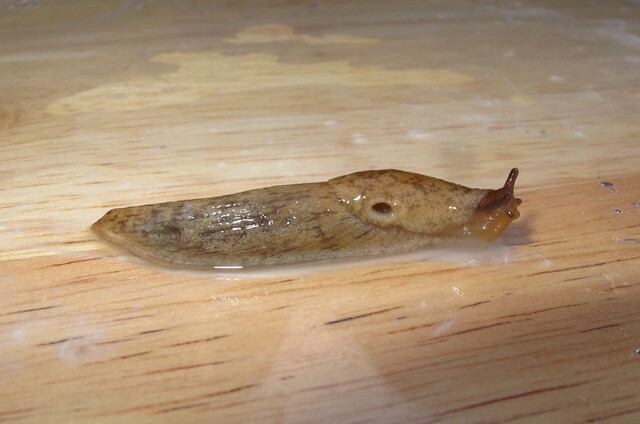 It seems that slugs also like pancakes, or at least they like pancake batter. One morning I absentmindedly left the mixing bowl with a little batter sitting on a rock near the stove. Some time latter, I returned to find this large slug and another smaller one checking out the batter. I moved the large one to a table top for some beauty shots, then released it to slither on its way. Three days ago, I left Nicol Island to make the long trek to the western boundary of Ontario, and then on to cross the prairies provinces. More photos and a bit about that leg of the trip sometime soon.